Arlington County is an urban community comprising 26 square miles across the Potomac River from Washington, D.C. It is bordered by Fairfax County and Falls Church City to the northwest, west, and southwest, the City of Alexandria to the southeast, and the District of Columbia to the northeast. It is the fourth most populous county in Northern Virginia, with more than 226,000 residents in 2016, a 9% increase from 2010. According to the U.S. Census Bureau in 2016, 62.9% of its residents identify as white alone, not Hispanic or Latino; 15.4% as Hispanic or Latino; 10% as Asian alone, not Hispanic or Latino; and 8.4% as black, not Hispanic or Latino. Compared to the state of Virginia, Arlington County has a black population that is half as large, and Asian and Hispanic populations that are about 1.5 times larger. Arlington has a median household income of $108,706—significantly larger than the statewide median of $66,149. Fewer Arlington residents live in poverty (8.7%) than in Virginia (11.4%), and 30% of all school-age children are eligible for free and reduced-price meals, smaller than the 41% of children across Virginia. According to the 2018 Community Health Rankings and Roadmaps project, Arlington County ranks 2nd healthiest of 134 Virginia counties based on length and quality of life measures. Specifically, the life expectancy of Arlington County is 83 years; higher than the state life expectancy of 79 years. The infant mortality rate was 3.1 per 1000 live births, lower than Virginia’s rate of 5.7 per 1000 live births. In Virginia, cancer is the leading cause of death, but Arlington County has the lowest incidence rates of most cancers, including breast, colon, lung, oral cavity, and prostate. 4% of adults in Arlington County have diabetes, compared to 10% statewide. The HIV prevalence rate is 541.6 cases per 100,000 people, which is almost twice Virginia’s rate of 298.5, and the 2nd highest rate in northern Virginia. This prevalence rate does not correlate with the prevalence rate for all sexually transmitted infections, which is 264.2, less than Virginia’s rate of 407. For males, the high HIV prevalence rate, as well as transmission of new HIV diagnoses, is primarily driven by male-to-male sexual contact, and for females, these rates are driven by heterosexual contact. HIV disproportionately affects black residents in the area, who have a prevalence rate of 3,134 cases per 100,000 people. Men also have a disproportionately high prevalence rate (1196.8) as do Hispanic residents (793.7). Although health indicators assist in understanding the health of a geographically defined population, they do not tell the whole story. For example, a baby born in census tract 1031 in Nauck can be expected to live 18 fewer years than a baby born on the other side of Interstate 395, in Crystal City (census tract 1034.02). Within these four miles, median annual income drops from $105,156 in Crystal City to $76,234 in Nauck; the percentage of adults with at least a bachelor’s degree drops from 80.3% to 28%; and the percentage of black and Hispanic residents jumps from 11.6% and 4% in Crystal City, to 50.1% and 24.8% in Nauck, respectively. Other measures of health tell similar stories of inequity when broken down by race: black residents have an infant mortality rate 3 times greater than that of white residents. Although Arlington residents across the board have better health outcomes than the rest of Virginia, amongst Medicare beneficiaries 65+, black residents have an increased rate of hospitalization due to high blood pressure. While rates of hospitalization due to heart disease are more equitable across races when compared to statewide rates, black residents still have an increased hospitalization rate, compared to white or Hispanic residents. Within Arlington County, there are significant disparities in health amongst people of different races, ethnicities, and incomes. These differences can be partially attributed to social determinants of health, which, according to the World Health Organization, are the conditions in which people are born, grow, work, live, and age. Although Arlington has a number of health resources, accessing health services proves challenging for some county residents. There is one primary care physician for every 1,360 county residents. These resources are not evenly spread, however. Although there is no widely accepted optimal rate of physicians to total population, a portion of southern Arlington between Nauck and Aurora Highlands has been designated by HRSA as a medically underserved area, meaning it contains fewer than 1 physician for every 3,500 residents. 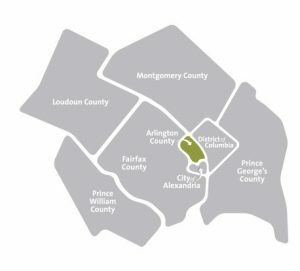 Neighborhood Health, a Federally Qualified Health Center, has a clinic located within the county, as well as facilities in neighboring Alexandria that serve Arlington residents. The Arlington Free Clinic, a non-profit charitable clinic, and the Arlington Pediatric Center, a part of the Virginia Hospital Center System, also serve Arlington’s low-income uninsured residents. Virginia Hospital Center, a 350-bed, not-for-profit teaching facility, is the main hospital serving Arlington. Additionally, there are many urgent care centers located within the county, and Arlington’s Department of Health provides immunizations, family planning, and services for maternity; dental; tuberculosis; HIV, STIs, and AIDS drug assistance; teens; women, infants and children (WIC); and refugees. In addition to geography, cost may be a barrier for the 10% of Arlington residents who are uninsured. Although this rate is lower than Virginia’s average of 14%, it remains higher than the averages of neighboring West Virginia (8%), Washington, DC (4%) and Maryland (7%), where Medicaid was expanded. Those without insurance or resources to pay for care rely on safety-net health care clinics for primary health care services. Although Arlington County is one of the healthiest in Virginia, inequities amongst its residents persist. Making Arlington a healthier place for all to live requires not only expanding wellness initiatives and access to quality healthcare, but also addressing the economic and social wellbeing of its citizens.